Greatest Top 1oo People- The most Influenced in world History! Michael H. Hart (born April 28, 1932 in New York City) is a American astrophysicist who has also written three books on history and controversial articles on a variety of subjects. Hart describes himself as a Jeffersonian liberal, Hart, a graduate of the Bronx High School of Science who enlisted in the U.S. Army during the Korean war, received his undergraduate degree at Cornell University in mathematics and later earned a Ph.D. in astrophysics at Princeton University. He also holds graduates degrees in physics, astronomy, and computer science, as well as a law degree. He was a research scientist at NASA before leaving to be a professor of physics at Trinity University in San Antonio, Texas. He has also taught both astronomy and history of science at Anne Arundel Community College in Arnold, Maryland. 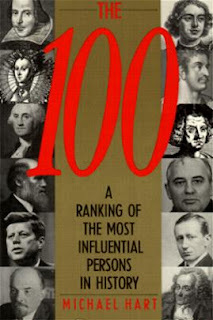 His best known book is The 100: A Ranking of the Most Influential Persons in History. His most recent book is Understanding Human History, which is a history of humanity beginning about 100,000 years ago and going through the 20th century. Unlike most other books on world history, Hart’s book explicitly discusses differences in average intelligence between various groups, explains when and why they arose, and discusses the effect that those differences have had on human history. this book which has sold more than 500,000 copies and been translated into 15 languages. His third book, A View from the Year 3000, published in 1999, is a history of the future which includes both technological advances and political developments. Why Muhammad as "Number ONE" in the List? Muhammad as number ONE to lead the list of the world's most influential persons may surprise some readers and may be questioned by others, but he was the only man in history who was supremely successful on both the religious and secular levels. Of humble origins, Muhammad founded and promulgated one of the world's great religions, and became an immensely effective political leader, diplomat, merchant, philosopher, orator, legislator, reformer, statesmen, husband, father and military leader the man whose legacy continues to shape people's life Today, thirteen centuries after his death, his influence is still powerful and pervasive. The majority of the persons in this book had the advantage of being born and raised in centers of civilization, highly cultured or politically pivotal nations. Muhammad, however, was born in the year 570 A.D, in the city of Mecca, in southern Arabia, at that time a backward area of the world, far from the centers of trade, art, and learning. Orphaned at age six (Father past way before his birth and mother past away when he was six), he was reared in modest surroundings. Islamic tradition tells us that he was illiterate. His economic position improved when, at age twenty-five, he married a wealthy widow. Nevertheless, as he approached forty, there was little outward indication that he was a remarkable person (Arabs nick named him as Al-Amin meaning "The Trustworthy"). Most Arabs at that time were pagans, who believed in many gods. There were, however, in Mecca, a small number of Jews and Christians; When he was forty years old, Muhammad became convinced that this one true God (Allah) was speaking to him, and had chosen him to spread the true faith. This flight, called the Hegira, was the turning point of the Prophet's life. In Mecca, he had few followers. In Medina, he had many more, and he soon acquired an influence that made him a virtual dictator. During the next few years, while Muhammad's following grew rapidly, a series of battles were fought between Medina and Mecca. This was ended in 630 with Muhammad's triumphant return to Mecca as conqueror. The remaining two and one-half years of his life witnessed the rapid conversion of the Arab tribes to the new religion. When Muhammad died, in 632, he was the effective ruler of all of southern Arabia. Muhammad, however, was responsible for both the theology of Islam and its main ethical and moral principles. In addition, he played the key role in proselytizing the new faith, and in establishing the religious practices of Islam. Moreover, he is the messenger of the Moslem holy scriptures, the Koran, a collection of certain of Muhammad's insights that he believed had been directly revealed to him by Allah. Most of these utterances were copied more or less faithfully during Muhammad's lifetime and were collected together in authoritative form not long after his death. No such detailed compilation of the teachings of Christ has survived. Since the Koran is at least as important to Moslems as the Bible is to Christians, the influence of Muhammed through the medium of the Koran has been enormous It is probable that the relative influence of Muhammad on Islam has been larger than the combined influence of Jesus Christ and St. Paul on Christianity. On the purely religious level, then, it seems likely that Muhammad has been as influential in human history.